Pizza night is quite possibly our favorite night at our house! 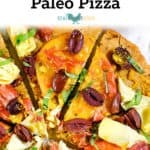 We love making Paleo pizza, and we vary the toppings often. 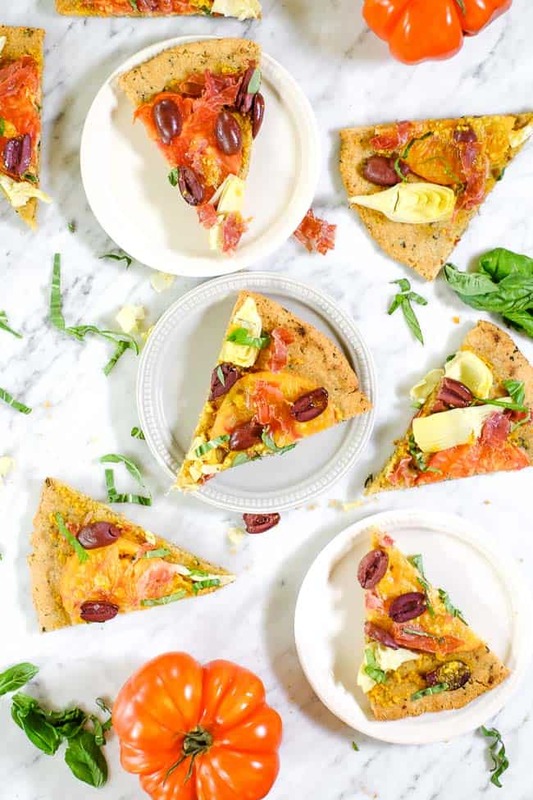 To go with the season, this grilled Paleo pizza is a little lighter and filled with fresh summer flavors! If you’ve never tried grilling your pizza before it is a fun way to enjoy everyone’s favorite meal! 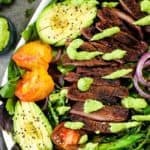 While we do sometimes make our crust from scratch – using this recipe – we often like the ease of a mix like Simple Mills Pizza Dough Mix or there are even some pre-made frozen crusts like Cappellos. Since I’ve been avoiding eggs for a bit now, the Simple Mills Pizza Dough Mix is a great option for us. You’ll notice in the recipe we use this mix and add some extra seasonings. There are also some newer frozen crusts available too, but we haven’t tried them yet. You might look for Caulipower or Cauliflour in your frozen foods section of the grocery store. 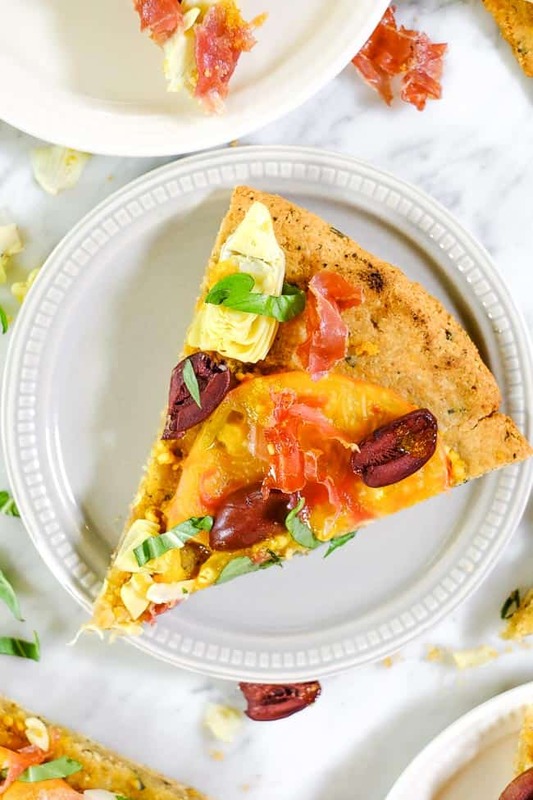 Cauliflour has a plant-based crust that is egg-free. Good news – you don’t need a pizza stone to grill your pizza! We found a round baking sheet at a garage sale a while back and use it, but prior to that we just used a regular old rectangular cookie sheet. And it worked just fine! 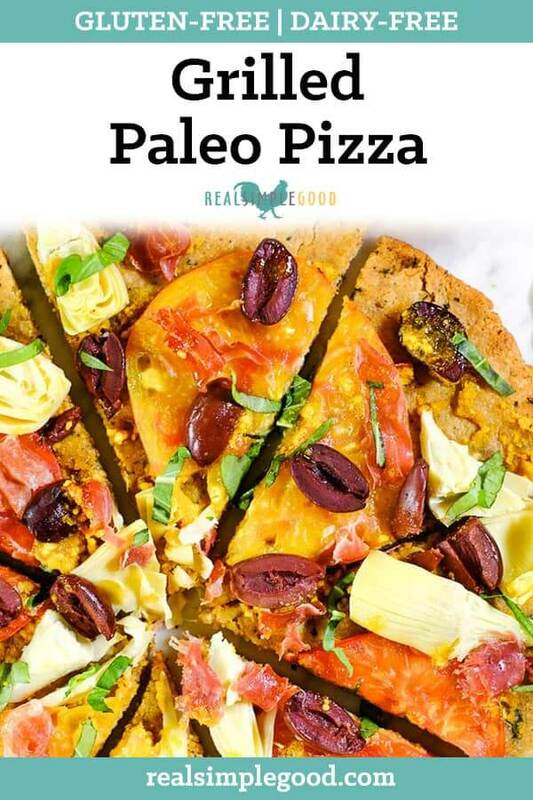 We love grilling our pizza on our Traeger wood pellet grill because it adds a little smoky flavor to this Paleo pizza, but it also works on a regular grill as well. After we grill our pizza crust for the first 15 minutes on the cooking sheet, sometimes we flip the crust right over onto the grill grate, and let the top cook for a few minutes to get those nice grill marks on the crust…but it’s definitely not necessary. 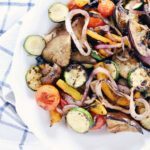 For this grilled Paleo pizza, we wanted to use fresh summer flavors to make a lighter, yet still satisfying pizza! And…we wanted to make it entirely dairy-free. For the sauce, it’s just a simple mixture of olive oil, garlic and nutritional yeast. We love Bob’s Red Mill nutritional yeast, and if you’ve never used it before you will enjoy the cheesy, umami flavor it adds! Nutritional yeast is an inactive yeast, that contains Vitamin B and folate. It is inactive, which means that people with Candida or yeast overgrowth issues don’t have to worry about it adding to their gut issues. 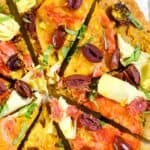 The rest of the toppings include heirloom tomatoes, kalamata olives, artichoke hearts, prosciutto and fresh basil. 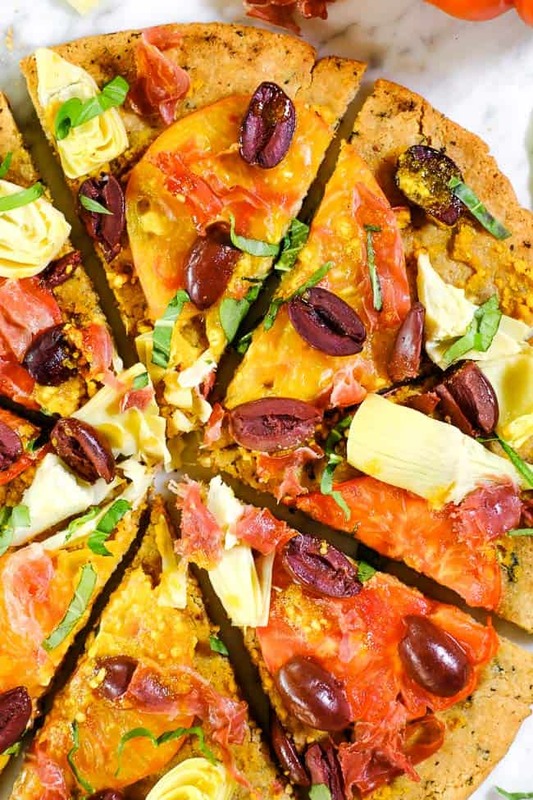 You will love how flavorful and summery this pizza tastes! 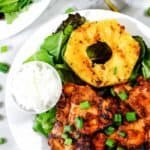 Summer is the perfect time to make this grilled Paleo pizza! 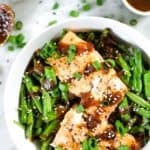 You’ll love the fresh and flavorful toppings and how it is a fun way to enjoy a family favorite meal! Leave a comment below to let us know how it goes. Also, take a pic and share it on Instagram. Tag us @realsimplegood, and give us a follow if you don’t already! 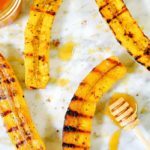 This grilled Paleo pizza is filled with fresh summer flavors - all while remaining gluten-free and dairy-free! 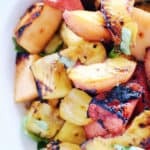 Enjoy a family friendly pizza on the grill! Preheat grill to medium heat or 350° Fahrenheit and line a baking sheet with parchment paper. Make sure no parchment paper hangs over the edges of the pan. Set aside. Make crust according to box, except before mixing add the rest of the seasonings listed above. Mix to combine all the ingredients and transfer to parchment lined baking sheet. Form dough into a large round circle with your hands and get as even and flat as possible, about a 1/4 inch thick. Transfer to grill and cook for 15 minutes. While crust is cooking, make sauce. Combine olive oil, garlic and nutritional yeast in a small jar or bowl. Take crust off grill after 15 minutes and turn grill up to high heat or 400°. 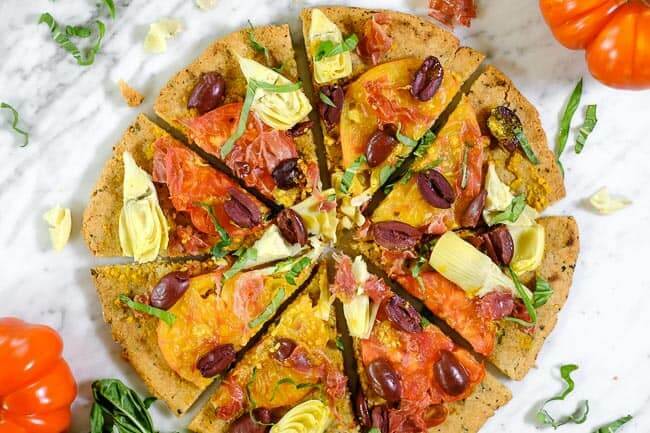 Top pizza with sauce, tomato, artichoke, olives and prosciutto. Return to grill and cook for 12-15 more minutes until all the toppings are heated through. Remove from grill and sprinkle on basil ribbons, slice and serve! Enjoy!